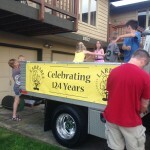 Goodbye, Dear Larrabee Elementary. For Real This Time. 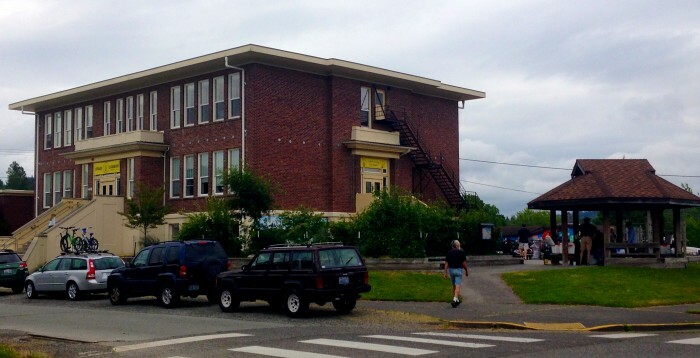 I’ve spent much of my (largely non-existent) thinking and quiet time the past year deciding how I would write my final post regarding our dear Larrabee Elementary and the closing of a small, historic school. I know that many of my Facebook friends have likely grown tired of my Larrabee posts on the subject. However, each of my posts was well-thought out and crafted before I clicked “post.” I thought each snippet and picture was important to help capture the closing process, and I wanted to honor in some small way our school, children, and families. I love history, community, friends, and moments. 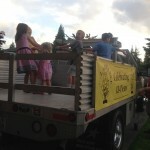 The last two years, from the initial motion to close our school, to the school board vote to close it, to our last year spent celebrating and honoring our Larrabee families past and present, have been an experience most of us never wanted to experience, but one in which we have learned and gained so much. 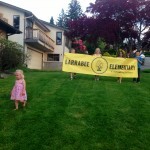 There were several families, who upon hearing the final vote to close Larrabee, pulled their children from the school. I don’t blame them. I half-considered it myself as I weighed my options. I could integrate my children into their new schools more quickly, avoid what one parent called “the slow death” of our school, and basically just cut ties and move on. 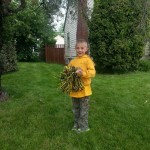 My son entered kindergarten this year; should I have him spend one year at a school doomed for closure, or put him in the school in which he’d finish his elementary years? The principals from the two schools our children will now attend, as well as our own Larrabee principal, have been supportive and kind during this transition for our children and families. I remain surprised and unimpressed by some personal friends and parents from other Bellingham schools who could not have cared less about our children or the transition and offered no support or care at all. I hope when and if your school closes or you ever need help, you will meet with a different and more caring response. 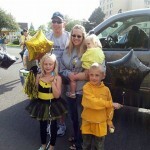 Anyway, along with many other families, I decided to stay put for Larrabee’s final year. My daughter is delightfully happy at Larrabee. My son would have a great year. I was committed to helping give Larrabee Elementary the closing year it deserved after serving as a public elementary school for 124 years. I have to say that I am proud, pleased, and have a peaceful heart about what we ALL did this past year to make that happen. Throughout this entire process, I grew closer to many folks at Larrabee than I would have otherwise. We grew to appreciate and respect each other while engaging in the challenge to save Larrabee, discussing the bond and school board issues, attending community and school board meetings, and finally, to the acceptance that we had lost on all fronts. We grieved, we hurt, we felt angry. Finally, the only thing left to do was pick up the pieces and move on in the most positive manner possible for our children and families. And so it ends. I am proud of what we did. We held the jog-a-thon fundraiser even while people wondered why we would waste our time for a school to close. We held our movie nights in our little gym, where the kids wore pajamas and the parents popped the popcorn. We continued our after-school enrichment activities (the most active in the city). We held our evenings of hip hop, choir, drama, and strings performances. Children painted salmon that now hang along the Larrabee fence; a permanent mark of their time at our school and a symbol of their migration to the next. I sat at the bottom of the stairs near the gazebo with my toddler most every afternoon this year, waiting for my two “big kids” to emerge from the doors and descend the Larrabee steps. I gathered my kindergartener and second-grader to my side for after-school hugs before releasing them to run and play on the school grounds. I talked with some parents, annoyed others, and laughed with many. All the while savoring each moment, for I knew it was all about to end and it was going to be a very quick year. It was. 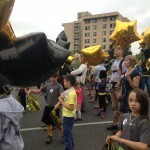 We participated in the parade, featuring bright yellow-and-black banners. 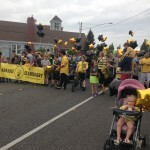 Hundreds of Larrabee Bees and their families dressed in Larrabee spirit wear and cheered. 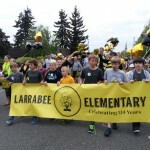 We held a “Then-And-Now-Night” that honored the old-timers and the rich history of Larrabee. 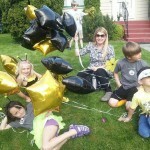 The PTA spent our last Larrabee funds on bouncy houses, pizza, music, and ice cream for the Larrabee community for the end-of school block party, which everyone enjoyed and earned a front-page article and great video in our local newspaper. So, this is it. 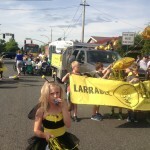 My final Larrabee post. It’s sadly, officially, time to move on. Some friends will travel together to our new schools and some will not. We will always see each other in our side of town, at activities, at the grocery store. The closure of our school is not what most of us wanted, but it is what it is. Am I sad? Yes. Angry? Yes. It’s a sad day for small neighborhood schools everywhere. Although I don’t always succeed, I remind and encourage myself regularly to not give in to my feelings of anger and sadness. I try to look at it as a great lesson for the little ones and a reminder for the parents; things don’t always happen the way you’d like. Regardless, you must pick up the pieces, put on a smile, learn something, and move forward. And that’s what we are all doing. Love you, our little brick Larrabee Elementary on the hill, and all of your staff, children, and families! Thank you for 124 years, and for one final lesson in how say goodbye with grace and dignity. 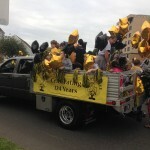 Larrabee Elementary Rocked the Parade, and Four Weeks to Go. George was in Alaska catching our halibut and blackcod quota. Fortunately, our good friend Matt was able to fill in for the banner-tying. Another family came over for the banner fun, and I have to say, it was actually a ton of fun. By the time the pizza arrived and we’d sat on the deck in the sunshine, enjoying the view of Bellingham Bay and sharing more than a few laughs for a good solid hour, Matt suggested we actually get to those banners. 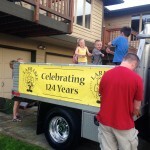 Matt attached two to George’s truck, and then the kids had fun marching up and down my front yard with the third and longest banner. 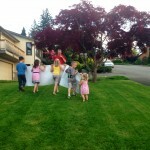 Next, the children marched through the neighborhood with the banner. They laughed, we micro-managed, and I have to say it was a most hilarious evening. 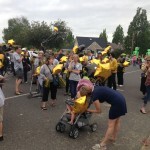 The next evening was the parade. 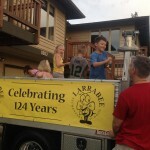 I was on the phone that afternoon with my friend, Carole, the official Larrabee parade organizer, when G literally pulled up in his Jeep from the airport, fresh from Alaska. He made it just in time to drive the truck in the parade! To the parade we went. We were not alone. 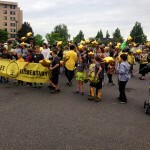 Tons of Larrabee students, family, staff, and alumni showed up to march with us all. 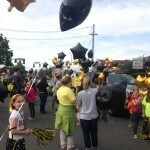 We had yellow and black balloons, kazoos, banners, cheer, and joy in abundance. 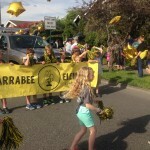 As we marched down the parade route, I saw people clapping for Larrabee. Giving Larrabee the thumbs up. A few even shed a tear or two as they smiled and waved to us. I felt like shedding a tear or two, myself. For in about one month, our school will be closed forever as an elementary school. Our students, families, and staff will be split up and dispersed among the district and other schools. But I didn’t cry this day. 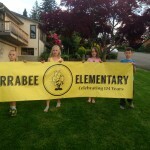 I smiled proudly and watched our children march strongly and happily with the Larrabee banner. I listened to them chant. Our Larrabee children were darling. I took in the event and the children and the families. I stored in all in my heart, where it will remain always. 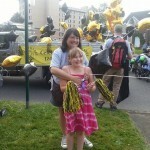 Please enjoy two parade videos taken by another Larrabee Mom, Norene, and some pictures I’ve gathered from Leanne, Carole, and me. Only Good Times Ahead. 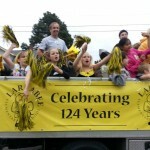 Cheer For Larrabee Elementary in the Parade! I am so excited; it’s supposed to be 79 degrees on Thursday. I was shocked when I saw that forecast on my weather app. I was looking for both a literal and figurative answer. But in the end, who cares? It’s going to be in the high 70 degrees on Thursday, and I can’t wait. Too bad the pool doesn’t open until May 12! We are gearing up for the end of the school year. 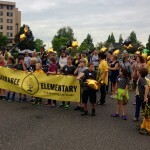 For us at Larrabee Elementary, it’s not just the end of another school year, but the end of our school. I have been hard at work with PTA officers to get our Larrabee Elementary parade entry lined up. 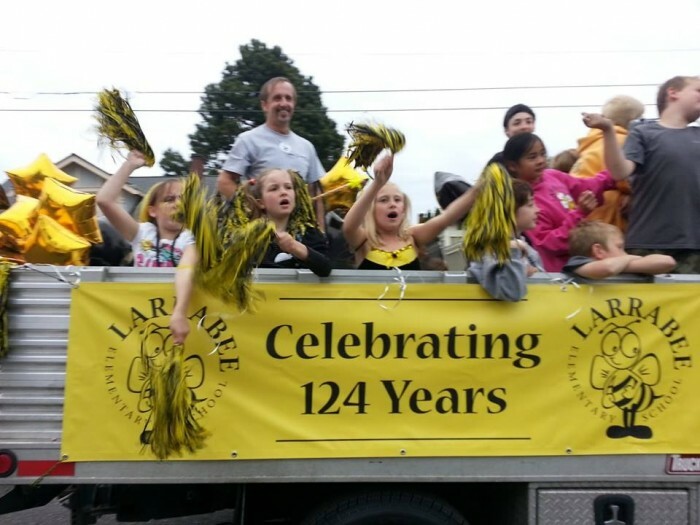 George will be driving our flatbed truck, in which many of our Larrabee children, parents, and staff will safely stand and cheer within guardrails along the parade route. 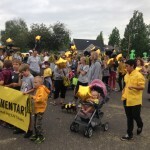 In addition, we have designed and ordered three dynamic yellow-and-black banners; one banner that several children will hold and walk with in front of the truck, and two smaller banners that will attach to either side of the truck. 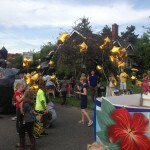 We will have balloons, noise, cheer, singing, and fun all along the parade route. This is going to be so cute; if you’re local, you won’t want to miss it. 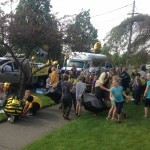 Come on down to the parade and watch these adorable, resilient children march on down the street. These are all children who are leaving their dear, familiar school and heading for new schools next year. 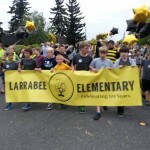 If you are a past or present Larrabee student, please ride or walk with us and celebrate a gracious and celebratory end to our 124-year old neighborhood and community school. In addition to this fun, I’m just excited for the rest of spring and all of summer. We have a camping trip coming up. A boat trip. The pool opens in mid-May. My birthday cruise is at the end of August. Nothing but sunshine and smiles, friends and family ahead, God willing. 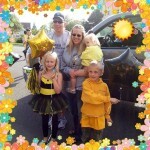 See you at the kiddie parade, if not sooner!